String them along with neon wires, and illuminate your interior like never before. Use neon wires (el wire) to edge every curve of your vehicles contour - Create a glowing outline of your vehicle, or use these neon colored wires to highlight your cars best features. Electroluminescent wire, or commonly known as el wire or el cable, looks similar to neon but has the flexibility and versatility of soft wire. It generates no heat, is non-toxic, can be applied to just about any surface, and produces a true 360 degree radiant soft NEON glow. El wire is durable, weatherproof and has a very low current draw. About 120 feet uses less than a 1 amp fuse. You’re sure to get noticed with neon string lights. Accent the interior of your vehicle by stringing neon colored wires over the dash, steering wheel, door panel, or anywhere else. 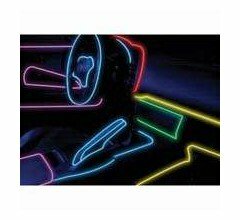 Take passengers for the ride of their life inside your glowing, vibrant vehicle with neon colored wires accenting every feature. And give your car’s interior an added edge by lighting it up for competition or just to show off to friends. Neon colored wires are power efficient and come in a variety of colors to fit your cars appearance. So string your car up today with our vast selection of neon colored wires.